Geeks and Shrinks. That’s who Robert Reich (former secretary of labor, not the Robert Reich who runs the BDNT Meetup) in his book ‘The Future of Work’ believes will rule the new economy. I’m no shrink, (Shrink = translator who communicates technical stuff to regular people). although I am a communication studies graduate, but am I geek? Let’s see what you think after one of my forays into the geek kingdom of the Front Range. 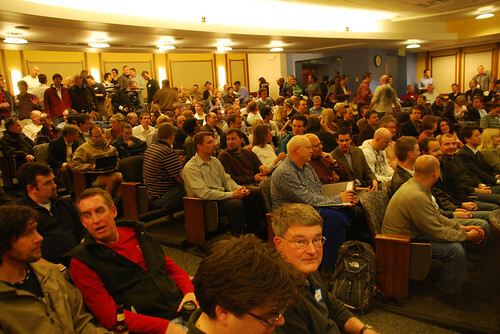 I’m at the Boulder-Denver New Tech meetup held at the Law Building at the University of Colorado at Boulder. If you want to see the new kingdom of geeks in one of their prime territories, there’s no other place to come…..I really wasn’t sure what to expect when driving to Boulder for this event. 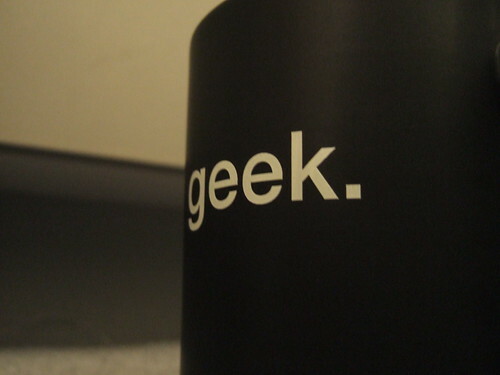 Of course the term “geek” pops in my head and I am thinking pocket protectors, single guys in their mid thirties to late 40’s perhaps some of them still living in their mothers basement, writing codes all day long. Boy was I wrong…. 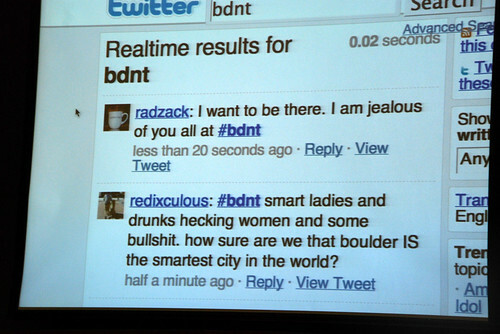 As the meeting begins I see that there are three screens up front, one for the speaker’s presentation, one for a bio and info of the speaker and to the right a large screen with a live feed from Twitter of a quickly trending topic; #bdnt. I see right away people commenting on the speaker and the event, jokes being made, shout outs to friends in the crowd and time to time some heckling. Everyone around me is tapping away on their laptops or of course iPhones making these micro-blogs themselves. I suddenly feel naked without my laptop and especially without my non-existent iPhone. I’m not sure what I would micro-blog about but I find myself wanting to be a part of the action. The Tweeting I find quite interesting, it reminds me of sitting in grade school passing notes to friends talking about the teacher or friends in our class. I guess this is the “new tech” way of passing notes. Only this time the speakers engage as well, unlike my teacher in grade school. They stop when chuckling begins and look to the Twitter screen to see someone asking if anyone in the door frame can pass him down a beer and continues to describe his location and appearance. It’s like a meeting within a meeting. Tech within tech. So this is the new geek kingdom……. now I know not everyone lives this way but even if these guys are 5 years ahead of their time, this is one heck of a future we are looking at! All in all, I have to say, my first foray to the Meetup was great. I learned a lot, not only about what a new geek looks like but also about new tech, and start ups that are popping up all over Northern Colorado. It was refreshing to see so much passion, intelligence and new ideas all in once place. This Meetup was my christening into my new found geekyness that working for Extanz has given me. 3. Follow people. Be patient. They will follow you back. 4. 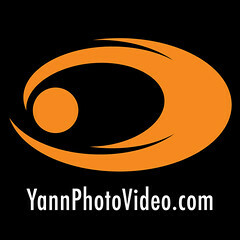 To communicate with the Twitter natives, just put @ in front of their usernames (like @YannR). 5. Share. Retweet stuff you think is valuable. Remember, it is not about you. It’s about creating a conversation online that mirrors face to face interaction. Be positive. Be enlightening. Evolve. Now if I could just get my hands on an iPhone……..